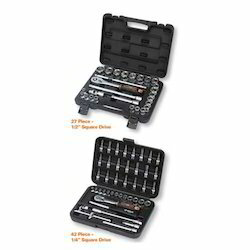 A collection of most commonly used sockets & accessories for safe storage & convenient carrying. These sockets are known for their better electrical conductivity and wear & tear resistance, which make them a preferred choice for automobile manufacturing and engineering industries. We offer a wide range of EP. ST Plug (3.5 mm) / P-38 ST. Socket AD to our clients. Made of quality material , these are appreciated all across the globe. Our clients can avail these at market leading prices. reverse, extension bars and sliding T-bar.